Expand your BYOB with these extra pages. Each binder will comfortably hold up to three insert pages. 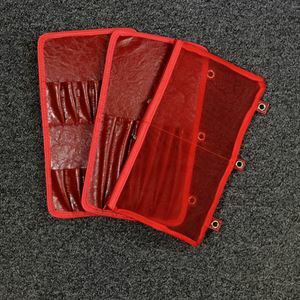 The Mesh Insert features 2 mesh zipped pockets, each measuring approx 6" (15cm) x 7" (18cm), and isperfect for storing interchangable cables, circular needles, pens, tapes measure and all sorts of notions. The Straight Insert has 12 slots, 6 on each side which measure 6" (15cm) high x 1" (2.5cm) wide. 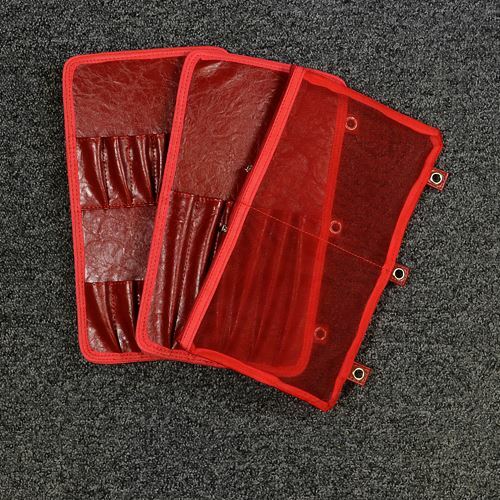 Each slot is fully reinforced with an elastic strap behind the slot to ensure that all sizes fit snugly. The page is ideal for organising straight needles and also longer DPN’s. Each page measures 12.5" (32cm) x 6.5" (16.5cm). The Interchangeable Insert is so much more than its name suggests. As well as the interchangeable tips it was originally designed for, it’s also a great way to store DPN’s and crochet hooks too. The page features 24 slots, 12 on each side. The slots measure 3" (7.5cm) high x 1" (2.5cm) across. Each slot is fully reinforced with an elastic strap behind the slot to ensure that all sizes fit snugly.